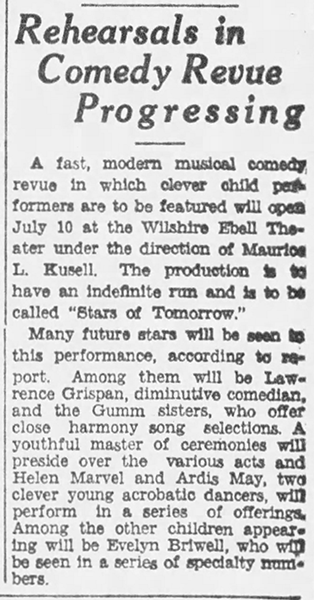 May 9, 1931: Judy and her sisters, “The Gumm Sisters, ” were in rehearsals for Maurice Kusell’s all-child revue titled “The Stars of Tomorrow” when they were mentioned a second time (the first time was April 12, 1931) in the Los Angeles Times as one of the show’s main attractions. The title of the show was right for at least one participant. 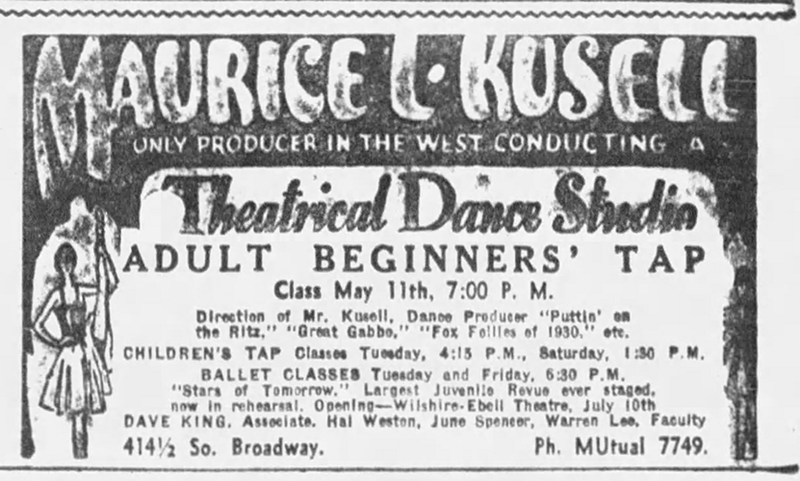 The show opened at the Wilshire-Ebell Theater in Los Angeles on July 10, 1931. The Gumm Sisters were featured in three song and dance numbers including “Puttin’ On The Ritz” in which they played “Harlem Crooners,” “Garden Of Beautiful Flowers,” in which they played “gardenettes,” and “Floatin’ Down The Mississippi.” Judy was also featured in two solos (the names of which are unknown), and teamed with Miss Betty Jean Allen for “A Plantation Melody.” The girls’ mom, Ethel, directed the show’s eight-piece orchestra. May 10, 1940: MGM recording session for Andy Hardy Meets Debutante. Judy pre-recorded “Alone” and “All I Do Is Dream Of You.” The latter would be cut from the film. May 10, 1941: A few clippings. 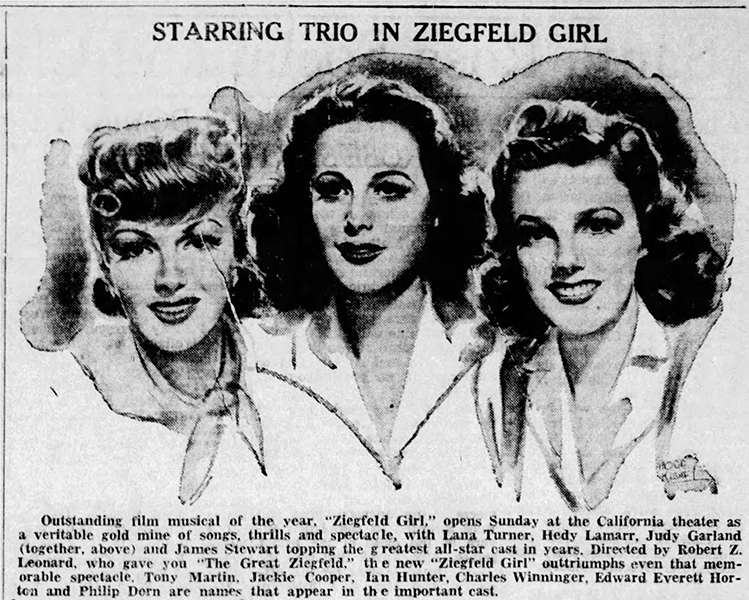 The first (top left) features a photo of Judy and her mom, Ethel, in Judy’s dressing room at MGM, tying in Judy’s latest film, Ziegfeld Girl, with Mother’s Day. 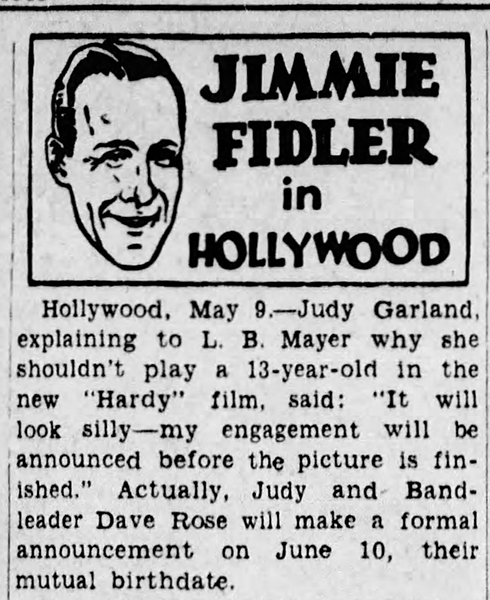 The second is part of Jimmie Fidler’s column in which he reports Judy telling MGM studio boss L.B. Mayer that she shouldn’t play a 13-year-old in the new “Hardy” film. If the conversation ever really happened it didn’t make any difference. 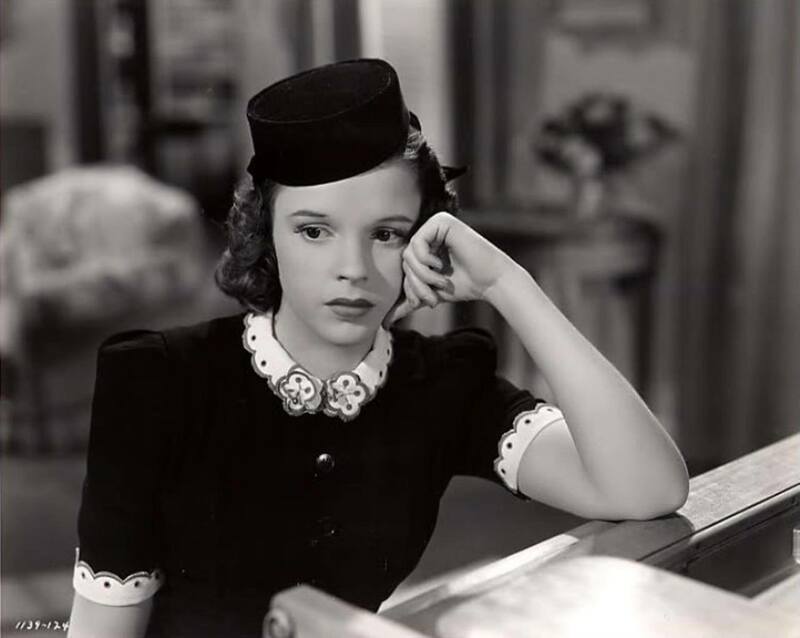 Judy was already at work on her next, and final, appearance in a Hardy film, Life Beings For Andy Hardy. The last is promotional artwork for Ziegfeld Girl. 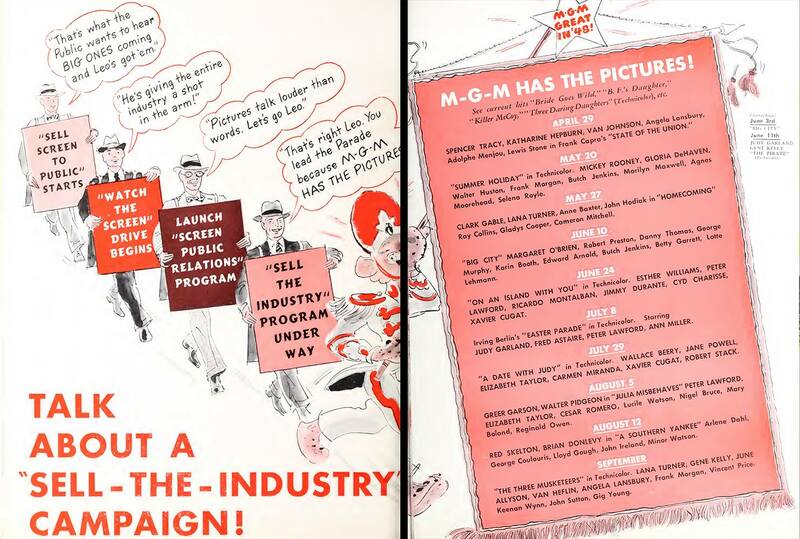 May 10, 1948: MGM – Great in ’48! This two-page ad appeared in the “Independent Exhibitor’s Film Bulletin” trade magazine. 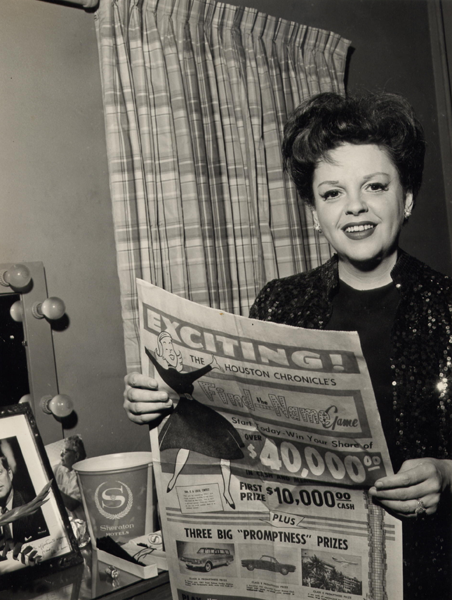 May 10, 1949: A milestone day in the life and career of Judy Garland. Judy had a 7:30 a.m. call for Annie Get Your Gun. She contacted the assistant director to tell him that she had overslept, wasn’t feeling well, had a bad night, and didn’t know if she would be able to make it to the studio. After chatting for 15 minutes, Judy felt better and said that she would make it to the studio but would be late. At 8:30 a.m. Judy’s makeup artist, Dorothy Ponedell, called the assistant director to say that Judy would be in. Judy called at 9:30 a.m. and told the assistant director that she would be in by 10:00 a.m.
Judy checked through the gate at MGM at 10:10 a.m. and went to her dressing room to be made up. 10:30 a.m.: Judy called to say that she would be right down on the set. At 11:18 Judy arrived on the set in her makeup but not in costume as she had a severe migraine and was unsure if she could complete the number (“I’m An Indian, Too). She rehearsed the dancing with Robert Alton who was staging and filming the dance numbers on the film. 11:55 – 12:55: Lunch. 1:15-1:30 p.m.: Just before returning to the set, Judy was handed a letter from L.K. Sidney, vice president of MGM, in her dressing. The letter reprimanded her for being “responsible delays” on the film – Judy refused to accept the blame when she had been telling the studio that Busby Berkeley (director of the film) was all wrong, which MGM finally agreed. Judy actually got the front office to apologize for the letter, but by the time she returned to the set, the company had already gone home as production was shut down at 2:10 p.m. Later that afternoon Judy was removed from Annie Get Your Gun and placed on suspension. The company was on layoff from May 11 through May 21, when the production was suspended until Betty Hutton replaced Judy on September 26th. May 10, 1956: The first official portraits of Judy with her one-year-old son, Joe Luft, hit the papers. Judy is, naturally, glowing with love for her son. May 10, 1958: Judy returned to her home state of Minnesota to participate in the state’s Centennial Celebration (which she performed at the following day).In this photo, Judy is attending the commemorative dinner the night of May 10th, singing “The Star-Spangled Banner. Front row, from left: Lt. Gov. Karl Rolvaag, Garland and Robert Snook, a centennial organizer. Back row, from left: Judge Luther Youngdahl, Mrs. James L. Morrill and University of Minnesota President James L. Morrill, and Eleanor Pillsbury. Newspaper reports state that Judy left the dinner early, before the main course was served, due to laryngitis. Miss Garland is one inch over five feet tall. She was wearing red satin shoes with teetering-tall heels. Despite her quips, however, Miss Garland likes the new sack look and chemise. She doesn’t like trapeze dresses. “And those balloon things look like something out of ‘Around the World in 80 Days,” she said. Although plump, Miss Garland believes she sings better that way. Miss Garland was accompanied by her husband, producer Sid Luft; her secretary, Ricky Ricardi, and was met by her conductor, Buster Davis. She is expected to ride in today’s parade and attend the Centennial dinner for VIP guests tonight in Pick-Nicollet hotel. May 10, 1961: Judy returned to Houston, Texas, performing at The Sam Houston Coliseum. 9,400 people attended the event. The video featured below was taken at Judy’s February 23, 1961, concert in Houston at the City Auditorium, giving us an idea of what the show was like. 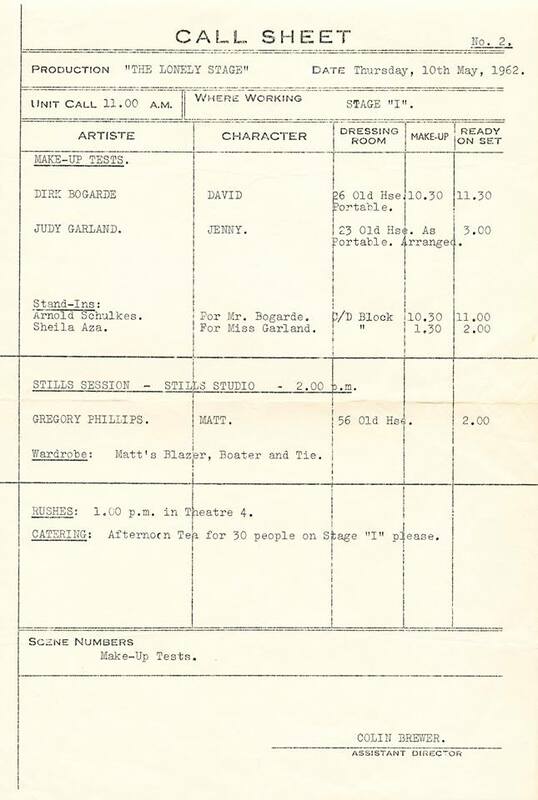 May 10, 1962: This call sheet for I Could Go On Singing (still titled The Lonely Stage) shows Judy and co-star Dirk Bogarde were both due in makeup at 10:30 a.m. for makeup tests. Their young costar, Gregory Phillips, had a 2 p.m. call for a stills session at the stills studio. 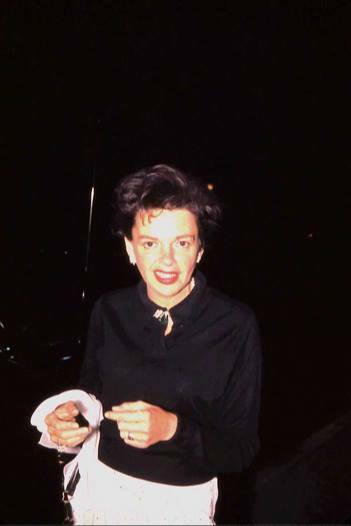 May 10, 1963: Judy gave a “mini-concert” for the CBS affiliates and executives at New York’s Waldorf-Astoria Hotel. She opened with a parody of the song “Call Me Irresponsible” (poking fun at her reputation as production on her new series was about to begin). This snapshot was taken at the event. May 10th was “Day 8” of the auction continued the multi-day the sale of “Antiques and Furniture” used in so many of the film. 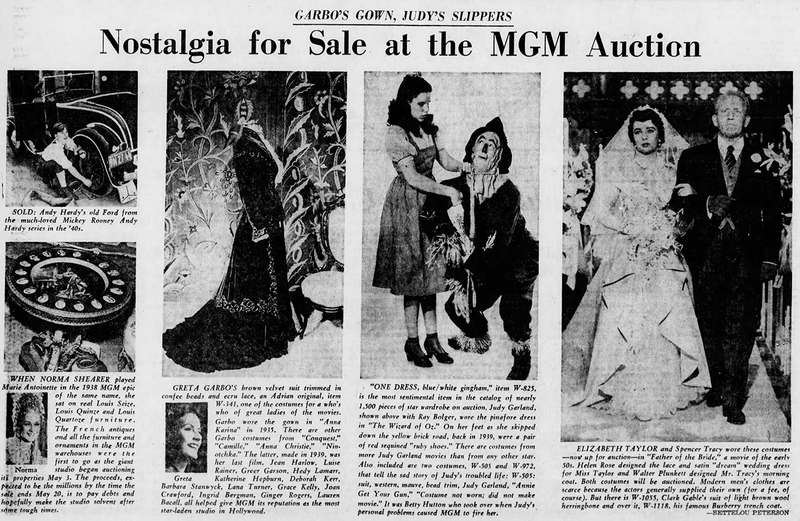 The sale of Judy’s Ruby Slippers from The Wizard of Oz was still a few days away. May 10, 2014: This article was published in the Sydney Morning Herald, focusing on Judy’s 1964 tour or Australia. The article was written by Bill Farr and features several examples of his artwork.